C:\Windows\system32\rundll32.exe ~$WO.FAT32,_ldr@16 desktop.ini RET TLS " "
You may refer to the images I uploaded below. It shows the contents of the flash drive. The command prompt shows the hidden contents. You can see there that there is a with a blank name. It contains the contents of the flash drive. That directory also has a desktop.ini inside it with these as contents. 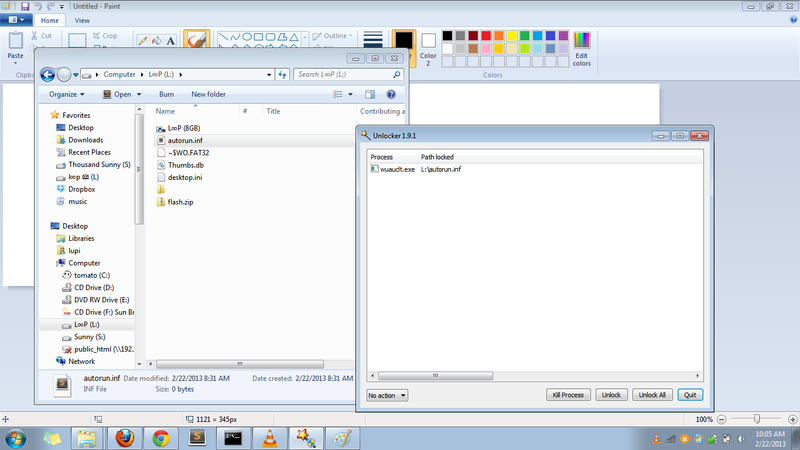 Unlike the first desktop.ini (found at the root of the flash drive). It has some kind of binary contents which frankly I don't know how to paste here. So I just uploaded the contents of the flash drive here. So you can view it yourself. 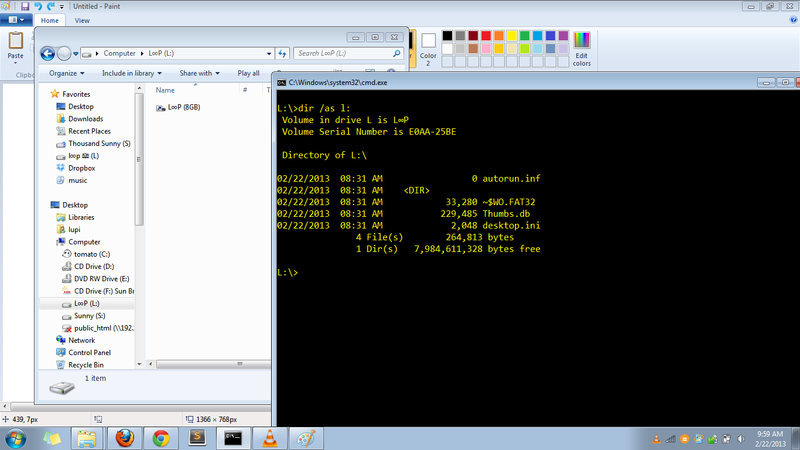 Another weird thing is the autorun.inf (which has only 0 bytes) is being used by the wuauclt.exe. You may refer to the second image below. Has anyone experienced this too? I already did tried reformatting and reinserting the flash drive but still no luck. I hashed the desktop.ini (the binary-like one) and searched for it. It pointed me these links which was just posted a few days ago. 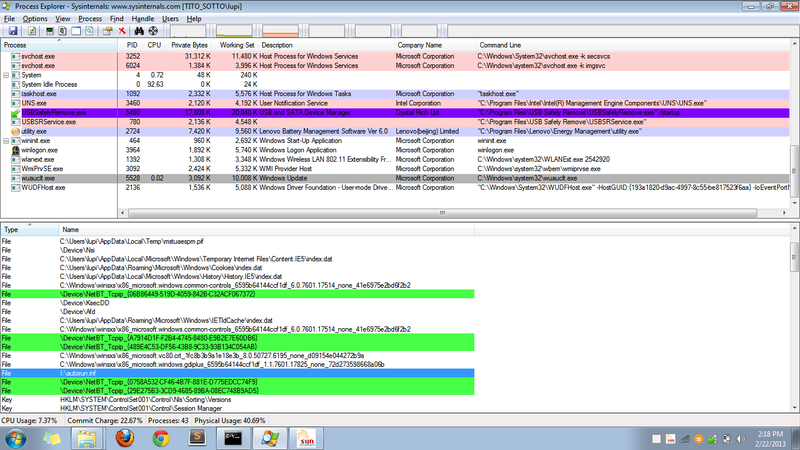 I viewed the handles of wuauclt.exe in the Process Explorer and saw the autorun.inf is being used by the exe. You may also notice that a file from the temp folder is opened. Here is the scan of that pif file from VirusTotal. Here is an online copy of the PIF file and lastly, a random file that was generated after I ran the PIF file (I used sandbox). I successfully removed it a few days back already. Though I just posted this one right now. Here is how I removed the backdoor from my computer. Just realized that the question itself is not a very good question. It is something more of a topic for discussion. Thanks for the 'protection' though. Use the command prompt to copy your files to your internal HDD (Make sure you have a virus software installed and fully updated before doing this) and then scan the files before formatting the drive, and then put the files back on the drive. Not the answer you're looking for? Browse other questions tagged usb usb-flash-drive virus desktop autorun or ask your own question. Does the “Desktop.ini” and “Thumbs.db” files are virus? How to prevent shortcut virus from affecting my pendrive and external disk? How to use USB flash drives with Windows 98?